Salto recently announced some exciting news regarding the “Clay by Salto” subscription charges, which make this Access Control Solution for SME’s even more attractive. Whether you are controlling 2 doors or 50 the subscription is now by users so it doesn’t matter how many doors that you want to control. Subscription charges are upto 50 users annual subscription is now $275 inc gst and each additional user is just $3 per month, it’s that easy! Eclipse Security System recommend Salto Systems for their high quality products and innovative security solutions. Salto addresses the needs of many industry sectors, such as healthcare, hotels, government, airports, manufacturing & education. When Salto launched Clay by Salto earlier this year, we were very excited to be able to offer a wireless access control solution from Salto, to small to medium sized businesses. Medium sized business embraced it, however the smaller businesses while loved the system, could not justify the ongoing fees which was calculated by number of users and the number of doors. This has now been resolved with NEW lower and easier ongoing charges that make it so affordable that you can’t afford, not to have Clay installed in your business. If you want to speak to us and find out more, please complete the form below and we will call you within 24 hours! Basic subscriptions will have a fixed fee for up to 50 users of $275 inc Gst per year. For over 50 users, numbers are exact – no more pre-set packs. You want 67 users? No problem — there is an exact price for 67 users. Any user over 50 will have a fixed price of $3 inc. Gst per user per year. We have eliminated the additional fee per ClayIQ. The number of ClayIQ’s you have is no longer relevant. Temporary Tags, active for one month, are still available. Existing Clay users will have been notified and their subscription updated as of 11th November 2014. Access Control, Access Control for SME's, Clay by Salto, Commercial Security, Salto, Salto Systems, Wireless Access Control. 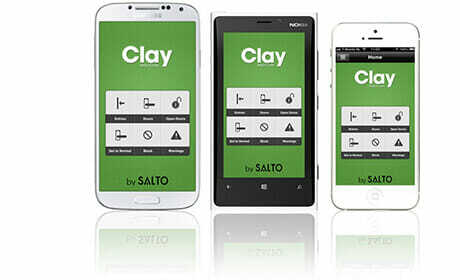 How does “Clay by Salto” work?